Orange County uses a variety of designations for its parks, including regional parks, wilderness parks, and historical parks. But in fact, every county park is a historical park – that is, every county park has a history, and every county park contains historic sites. And O’Neill Regional Park is no exception. O’Neill Park is the second oldest park in the county system. It was almost established in 1939, when the county first considered acquiring land along Trabuco Creek, but it was not until 1948 that the O’Neill family donated the first 270 acres to the county. Through donation and purchase, O’Neill Park has now grown to over 3,800 acres, including the 935-acre Arroyo Trabuco Extension, donated by the O’Neills in 1982. O’Neill was the county’s first camping park, and is popular for picnicking and hiking as well. Much of the history of the area that is now O’Neill Regional Park can be seen in the various historic sites scattered around the park. Some are literally only a “site,” but there are many remains to be seen as well. This map, adapted from the park map of the mid-1970s, will help to identify the general location of some of the historical spots listed below. Acorns were an important food source for the Indian people who once lived along the banks of Trabuco Creek, making the oak lands of O’Neill Park a valuable resource. The best-known village within the park was Alauna, which is believed to have been located near where the Trabuco Adobe was later built (see below). Father Gerónimo Boscana, who served at Mission San Juan Capistrano from 1814-26, reported that the name Alauna “signifies to raise the head in looking upward. This alludes to this rancheria having been located at the foot of a very high mountain which today is called El Trabuco.” The village (also sometimes spelled Alume) is mentioned repeatedly in mission records. Baptisms of people from the village are recorded between 1777 and 1820. A typical Southern California Indian village (from Bleeker, The Mission Indians of California, 1956). The first Spanish overland expedition through California was led by Gaspar de Portolá in the summer of 1769. During their march north, the men camped along Trabuco Creek, probably near the foot of Lone Hill, which some of the men climbed to get a view out to sea. Father Juan Crespí, official diarist of the expedition, named the spot San Francisco Solano, but during their stay, one of the soldiers lost his gun – in Spanish, his trabuco, and that name soon became attached to the area. The expedition rested here one day (July 25, 1769) before continuing on to their next camp near Tomato Springs. Trabuco Creek was initially considered as a location for a Spanish mission, but San Juan Capistrano was chosen instead, and the Trabuco area became one of its ranches. Cattle, sheep, and horses were grazed on the Trabuco Mesa and perhaps as early as 1806, an adobe outpost was built here. The two-room adobe had a tile floor and tile roof. One small room was probably home to the mission’s majordomo; the larger room was probably used for storage. A third room was added around 1840, enlarging the building to approximately 70 x 25 feet. With the demise of the missions, the adobe became the headquarters for the Rancho Trabuco. In the late 19th century the rancho was generally leased to Basque ranchers for grazing sheep. The adobe was occupied by them until about 1900 when it was destroyed in a fire. The last remains were covered in the 1960s and later boxed-in. An entrance gate near the southern end of Arroyo Vista in Rancho Santa Margarita provides easy access to the site. The Trabuco Adobe ruins, circa 1930 (courtesy the First American Corp.). What is now called the “Hoffman Homestead” was actually the Straw Homestead. Philander W. Straw and his family settled in Live Oak Canyon around 1878. Straw (1831-1899), a Civil War veteran, came seeking a drier, healthier climate. Like a number of early canyon residents, Straw was primarily a beekeeper. He built a two-story home and a number of outbuildings. The house was just a few hundred feet north of the “Hoffman Homestead” remains (see below) on the east side of the trail. Much of the 158-acre Straw homestead is now a part of O’Neill Park. The Straw Homestead in the early 1900s (courtesy Doug McIntosh). P.W. Straw’s son Gus (1877-1959) took over the ranch after his father’s death and added to it, buying an adjoining 80-acres to the northwest. Gus Straw ran cattle, raised pigs, and kept bees. To develop more water for the ranch, he built a small earthen dam in a side canyon. Though it washed out in the big floods of 1969, the remains can still be seen just up the park’s Vista Trail on the right. The remains of one of Gus Straw’s cattle pens can still be seen at the northern end of the park, near the entrance to the Ramakrishna Monastery. The remains of one of Gus Straw’s corrals, 2016. What the park now calls Vista Point was known to the Straw family as Inspiration Point. To water his cattle, Gus Straw dug a pond on the top of the ridge below the point. It still fills with water during wet winters. Gus Straw, on the ridge between Live Oak and Oso canyons, 1937 (courtesy Dave McIntosh). A similar view in 2018. In 1902 Gus Straw married Trabuco schoolteacher Pearl Gray. They built a new house just south of his parents’ place. He continued to run cattle on the ranch until 1941 when he and his brother Herbert sold most of the property (300 acres) to a group of British-born intellectuals who announced plans for an artists’ and writers’ colony. This eventually became the Ramakrishna Monastery. Straw held on to his house and a little land around it, but spent more and more of his time at his home in Laguna Beach. After Pearl Straw died in 1952 he sold his last eleven acres to Andrew Hoffman. Thus, Straw’s old home site is today marked on maps as the Hoffman Homestead. Andrew Hoffman (1899-1979) had been in the shoe repair business in Orange County since the 1920s. Around 1950 he took over the shoe shop at the PX on the El Toro Marine Base. Like a number of people connected with the base, that brought him to Trabuco. He greatly expanded Straw’s little home (Hoffman and his wife, Anna, had ten children) and lived here for more than twenty years until declining health forced him to move out. The park acquired the property in 1974. The Gus Straw home (right) in 1976, showing the additions (left) built by Andrew Hoffman. Only the retaining walls stand today (courtesy Dave McIntosh). Trabuco and Live Oak canyons began to settle up in the 1870s and soon there were enough children to justify a local school. The Trabuco School District was formed in 1879 and was the first school district in the Santa Ana Mountains. Classes were held in various ranch buildings until 1888, when the district acquired three acres for a permanent site. The new schoolhouse was located at the bottom of Live Oak Canyon, near what is now the park’s Sycamore Flats A group area. Besides classes, the building was also used for everything from church services to Saturday night dances. In 1926, average attendance dropped to just four students. The district was suspended and the old schoolhouse was eventually torn down. During the 1930s the El Toro School District sometimes held classes in the canyon, but it was not until 1942 that the Trabuco School District was re-established. The school moved to its current location in 1946, but remained a one-room schoolhouse until 1955. Today it is Orange County’s last rural school. The Trabuco School, circa 1910. All eight grades were taught in this one building. In the 1890s, the Trabuco Mesa switched from sheep ranching to dry farming. In 1893 Ben Kohlmeier leased some 3,000 acres between Trabuco Creek and Tijeras Creek and planted barley. He established his headquarters along Trabuco Creek in what is now O’Neill Park. From there, a rough road climbed a small canyon up onto the Mesa, much as the park road to the Mesa Day Use area does today. He built a small house and large barn. He farmed the Mesa with various partners until 1903 when James Sleeper and Cood Adams bought the lease. “Big Jim” Sleeper (the historian’s grandfather) had been farming on the Irvine Ranch for 15 years, so he knew a thing or two about dry farming – and the life of a tenant farmer. Big Jim Sleeper was appointed County Assessor in 1911, and moved to Santa Ana. He would spend the next 33 years in county office. To keep up his farming operation, he took on a new partner, William Waller, who moved into the Sleeper “bungalow.” In 1919 Sleeper sold out to “Billy” Waller, who continued farming on the Trabuco Mesa until around 1927, when he moved his operations over to Aliso Canyon, where he lived in the James McFadden ranch house (coincidentally, now owned by OC Parks). The Sleeper ranch house along Trabuco Creek, circa 1910. Just below the 241 tollway bridge along the Arroyo Trabuco Trail is a concrete watering trough, a reminder of the days when the Rancho Mission Viejo ran cattle in the area. It was probably built before World War II. The old watering trough today (left) and a photo of “Big Jim” Sleeper at a similar spot on the Rancho Mission Viejo, circa 1940. Franklin Roosevelt’s “New Deal” spawned a host of new government programs designed to battle the Great Depression of the 1930s. One of the best remembered is the Civilian Conservation Corps, which offered work instead of welfare for young men across the nation. In Trabuco Canyon, Camp Trabuco was established in 1933, and became the key camp in the Santa Ana Mountains. It was located on the site of today’s Trabuco Elementary School campus and the adjoining parkland and included barracks, a dining hall, and other buildings to house and feed more than 200 workers. The “CCC boys” (as most everyone called them) built roads and firebreaks, check dams for erosion control, and helped fight fires in the mountains. Camp Trabuco was active until 1936 and the buildings were torn down in 1940. The Trabuco CCC camp, 1933 (courtesy the Orange County Archives). Development of O’Neill Park began soon after the county acquired the first 270 acres in 1948. The park had a “soft opening” sometime in 1949 and construction was still underway when the official dedication of O’Neill Park was held on June 18, 1950. Several hundred people attended a luncheon under the trees with music, and barbecued beef cooked by the Trabuco Volunteer Fire Department. The original entrance to the park was near the eastern end of the property; it is still marked today by two signed stone pillars and the little entrance station building. The low stone wall all along Trabuco and Live Oak Canyon roads marks the original northern boundaries of the park. The main entrance was shifted to its current location in 1968. 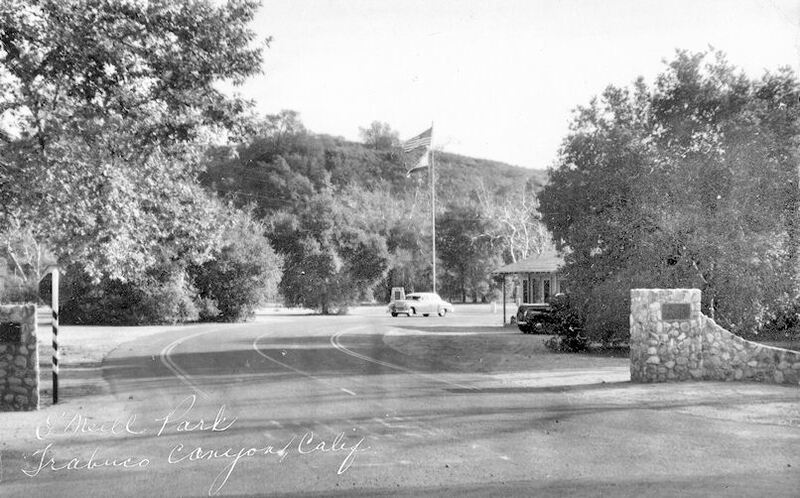 The original entrance to O’Neill Park, circa 1955 (courtesy the Orange County Archives). O’Neill Park also featured a number of hand-built stone barbecues for campers and picnickers. Today only one survives, a short ways to the southeast of the original entrance station. A barbecue area in O’Neill Park in 1955 (top, courtesy the Orange County Archives) and the last surviving stone barbecue, unused now, in 2018. In 1963, the O’Neill family donated an additional 130 acres to the county south of Trabuco Creek and up onto the edge of the Trabuco Mesa. One of the landmarks of the new section was a massive sycamore tree at the foot of the Mesa. Erosion had left the roots badly exposed, so county crews went to work, building stone retaining walls and re-packing soil around them. For his dedicated services to the County of Orange, his human interest in all its employees, and in grateful appreciation for the creative vision and practicality which has characterized his many important contributions to the parks of Orange County. 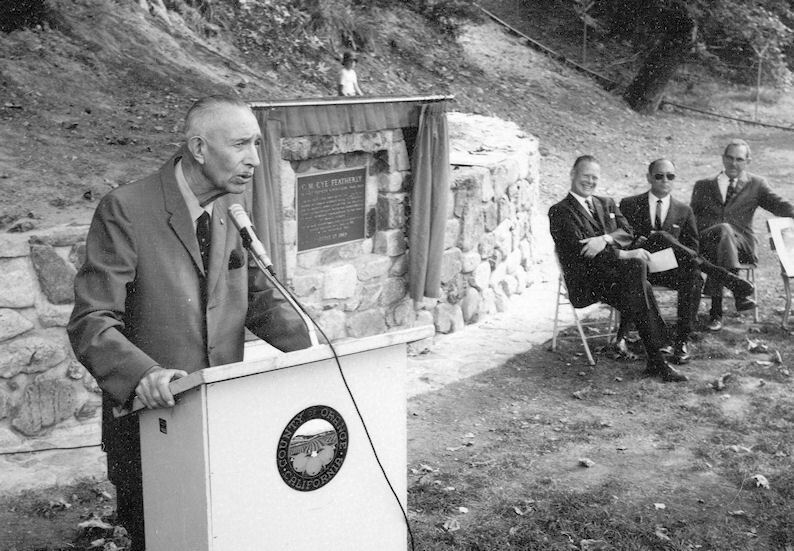 Supervisor Cye Featherly, speaking at the dedication of the tree named in his honor, 1968 (courtesy the Orange County Archives). Longtime Fullerton Union High School teacher Edna Spaulding, an authority on local wildflowers, began using the east side of the park for school field trips in the early 1950s. In 1964, an old road through a side canyon was converted into a self-guided nature trail which (at the suggestion of the Audubon Society) was named in her honor. Spaulding and a number of her former students attended the dedication ceremony on April 4th. Spaulding taught science at FUHS from 1923-1951. The monument placed at the foot of the trail is still in place, though the dedication plaque is missing. The 1970s trail brochure lists 14 interpretive stops, while the current version has only eight. 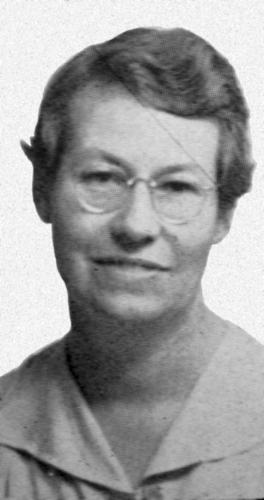 Edna Spaulding, from the 1947 Fullerton Union High School Pleiades (courtesy the Fullerton Public Library). Gale Warren Harmon (1903-1984) was a dentist by trade but an avid horseman by avocation. Born in Santa Ana and long a resident of Westminster, he was active with the Associated Riding Clubs of Orange County for decades and served as vice president of the California State Horsemen’s Association. In August 1973, the Orange County Board of Supervisors named the equestrian area at O’Neill Park in his honor. The dedication plaque notes that he “devoted much time and energy to the development of equestrian facilities and furthering the equestrian cause.” He helped to encourage the development of riding trails throughout the county.